We arrived at Flo’s at just around 3:30 p.m. As usual, there were no parking spots in the gravel lot that surrounds the building, so I made my own. There was a small crowd gathered around the main window, so Mom and I quickly stood in the ordering line to – what else – place our order. Mom had already decided on what she wanted – an order of fish and chips with some clam cakes. I was also going to have some clam cakes (we were going to order a half dozen) and, believe it or not, a burger. Flo’s has always made a great burger. When it was finally our turn to place an order, the cashier at the window informed us that they did not have any fish available. 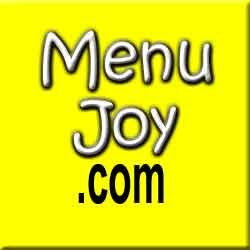 No fish at a seafood restaurant? Uh oh. I panicked and turned to Mom, who instead ordered a burger and changed our half dozen clam cakes to one dozen. We also ordered two cans of diet root beer. The female cashier handed me a white rock with a number painted on it, and also gave me the two cans of soda. The rock is how Flo’s keeps track of your order. They hand you a rock, you wait in line until your rock's number is called, and then return said rock. Our number was 56, and our total was $13.99. Mom and I slowly backed away from the ordering window (there were all kinds of people crowding in on us), grabbed some straws, napkins, and some vinegar for me, and took a seat at one of the outdoor picnic tables at the side of the building. I later moved my car so that I could be parked in an actual parking spot, not like the fake one I created out of pure laziness. While sitting and waiting for our food, we talked about how Flo’s has never changed. Even when my parents used to visit Flo’s before my sister and I existed, this cozy wooden shack has pretty much stayed the same. There is a giant white buoy by the main window that all kids love to sit on, lots of ropes and nautical knickknacks decorating the building, and a side lot filled with blue picnic benches where diners can sit and take in all of the fresh ocean air. Be careful, though. If you look up, you’ll often see a gang of seagulls hovering over you. I wouldn’t suggest feeding them as the other patrons eating would probably frown upon a bird turd ending up in their clam chowder. However, if there are leftovers, there is a small beach right across the street where people often let the birdies have a nosh. There is even a sign letting customers know that Flo's is closed during hurricanes. Good to know! I’m sure you could see how my mother and I were mistaken. Apparently the barely-there line at the bottom was put there to prevent morons (oops) from thinking that it was the number 06, but to us, it looked like 56. Maybe if they hadn’t painted the number with hot pink nail polish we would have been able to read it a better. Nevertheless, I took the food from the cashier, felt the bags to see if the food was still hot, and took my seat with Mom. When I did, Mom was frenzied because she didn’t know what was taking me so long. What I didn’t know was that she had gotten up off the bench a few times to see if I was still in line, or if I had taken off. Where was I going to go? I was hungry! Jokingly, she said, “You weren’t number 90, were you?” Since we were seated right next to the guy with the green shirt who I was talking to about how number 90 better get their act together and get their food, I told Mom what happened in a low voice. She was shocked. She said, “But it was number 56!” I had to explain about how we had apparently been holding the rock upside down the entire time. “Ohhhhhhhh,” said Mom. “I guess so.” She then told me that a man had come up to her because she had been sitting alone for a while to ask her if she was number 90. Little did she know, she was! I feel a little rotten that I wasn't able to get a full price list, however, Flo's is very inexpensive. For only $13.99, Mom and I had two sodas, two burgers, and a dozen clam cakes. That's a lot of food, and not a lot of cash. With all the drama going on with my rock number, I tried to get a picture of the menu, but it didn't come out clear. The bright side is that you don't really need a menu at Flo's. If you want seafood, they have it. That's the bottom line. I tried asking for a take-out menu, but they don't exist. Here is what I was able to find out: chowder combo ($4.95), and I believe this consists of a bowl of chowder and a handful of clam cakes; clam cakes ($2.95 for 1/2 doz., $4.95 for doz. ); stuffed quahog ($2); fish and chips ($6.95); fish only ($4.95); lobster roll ($10.75); fish sandwich ($4.25); plain or creamy chowda (and yes, they spell it like that - $2.95/$3.95); fried clams (starting at $11+); clam strips (starting at $7+); and other stuff like scallops, onion rings, chicken fingers, fried calamari, and any other kind of fried seafood you can think of. Finally, after what seemed like hours, we were finally able to dig into our food. Both burgers were juicy and delicious. I’m not sure what kind of meat Flo’s uses, but I’ve never found a chewy piece of fat nor an uncooked section. Neither has Mom. 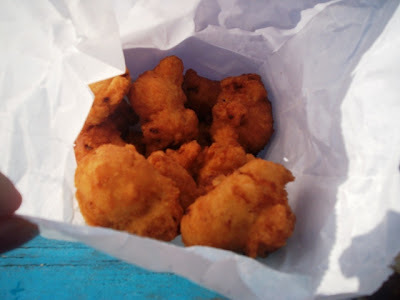 Our bag of clam cakes were still steaming hot (I’m surprised) with a crispy coating and soft interior. There weren’t too many clams in the cakes, but this is fine with me because I enjoy the clam taste, and not necessarily the clam feel. Mom feels the same way. We ate in seconds because we were so famished and annoyed. When we had finished, there were still about four clam cakes left in the bag. Mom and I got in the car and parked on the other side of the street so Mom could chuck the clam cakes out the window for the birds. After we realized that the cakes wouldn’t get very far, Mom got out of the car and hurled the food onto the beach. Seagulls were flying in every direction. I even spotted one flying off with an entire clam cake in its beak! I hope he, or she, enjoyed it as much as we did. 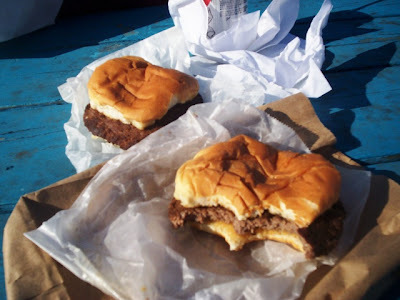 Flo’s Clam Shack on Island Park has been famous for clams since 1936 and is a staple, especially around this area. 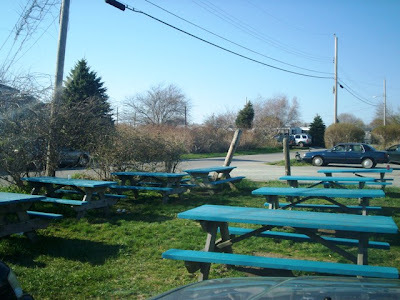 It’s often the first outdoor restaurant that Southern New Englanders visit when spring starts, and just before Flo's closes for the year, those same people visit for a last hurrah before the fall weather rolls in. Although illegible rocks could pose a problem, it has been run this way for years and I wouldn’t change a thing. Just make sure you aren’t holding your rock upside down. 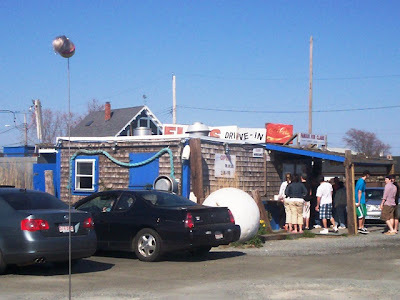 Flo’s Clam Shack in Portsmouth is open from 11 a.m. to 8 p.m. Friday through Sunday. Flo’s also has an indoor restaurant on Wave Avenue in Middletown, RI.